Signs In One Day is your one stop shop for all of your signage needs! We offer custom work for all types of signs. Not quite sure what you want? There is no need to worry when you work with Signs In One Day! Our expert staff has over 25 years of experience and will work with you to help you get the finished product that you are looking for. We are proud to offer services in Fort Myers and Cape Coral and look forward to creating signs for you. There is no job that is too small or too big for Signs In One Day. We are a rapid completion signage company devoted to getting your your signage and digital printing done in the quickest time possible. All signs are custom made for you when you place the order. 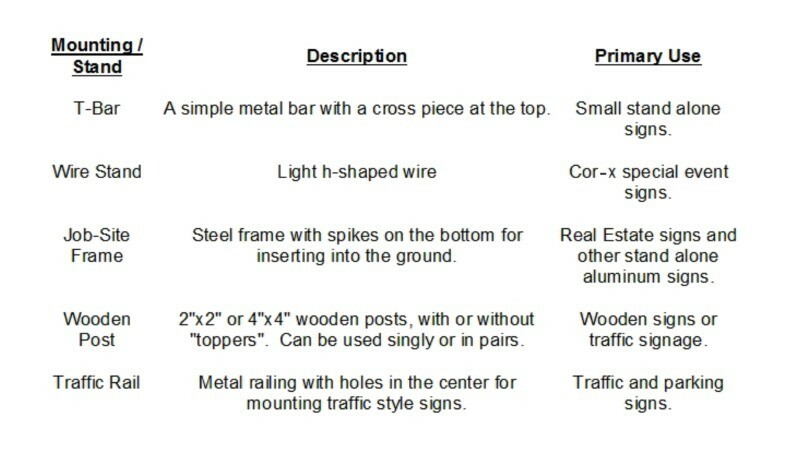 Below are some examples of common signs along with some materials and signage design references. Once you have decided on what you need just contact us for a quote, or simply contact us and we will be happy to help you decide what you need. Vinyl Vinyl is the most common material for applying text and graphics to signs. Almost any design or text style, in many different colors, can be applied to a sign with vinyl. This is the most economical way to letter your sign. Vinyl lasts up to 5 years and can be changed much easier than paint or other types of lettering materials. 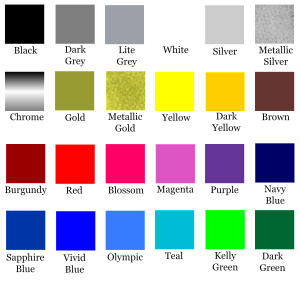 Below are just a few of the common colors we offer in vinyl lettering and graphics. Vinyl Appropriate Designs Vinyl graphics are cut from rolls of vinyl by our plotters. While our equipment is cutting edge, there are some things that vinyl just can’t do. These includes things such as photographs and anything with continuous tone gradients. Also there are some things that just don’t turn out well, such as very small text (less than .25″) and designs with very small detail. In situations that are not appropriate for vinyl, Digital Prints are available. 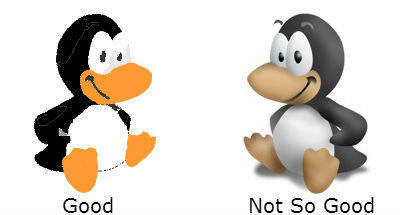 Here are some examples of good vinyl designs and not so good designs: You can see the difference in the above images. The picture on the left has definite borders where one color stops and another one starts while the one on the right is smooth shaded. Both images could be put on a sign, but only one in vinyl. Digital Prints Digital Printing is a full color solution for signage. Digital Printing involves printing your sign graphics directly on a full color decal. Almost anything can be put on a digital print, from photographs to small text. The material used to print on is self-adhesive and can be applied to any of our sign backings. 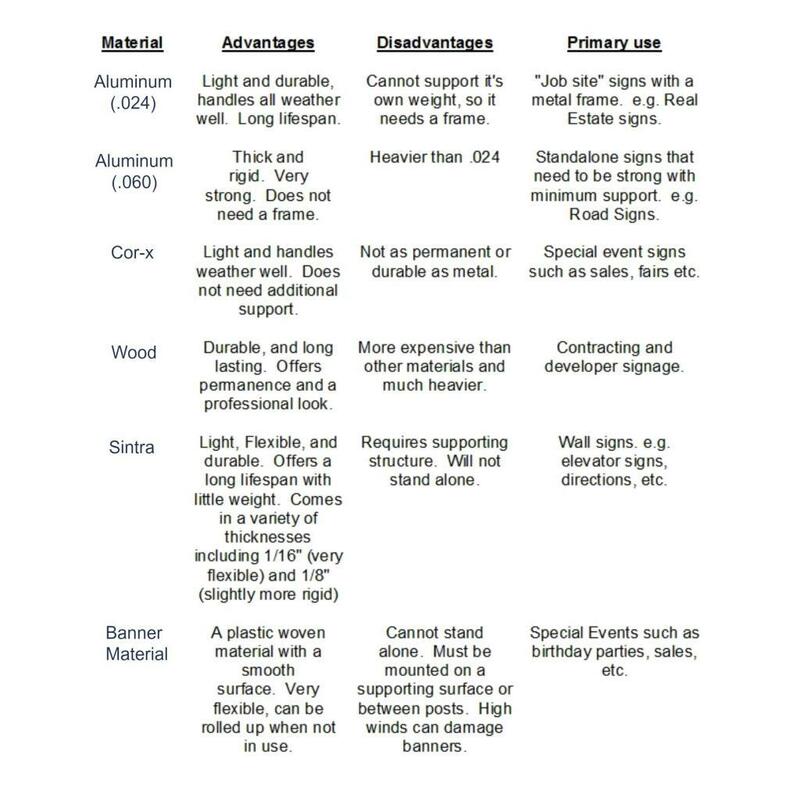 Below are some basic sign design guidelines, like how to choose the right colors, fonts and text size for your application. Sign Elements Visibility -The sign should be the right size for the intended purpose, and audience. Styling is also an important element in visibility. Stand-out or “Pop” -The sign should be designed so that it stands out from it’s environment. The color, size, fonts etc. all play an important part in this. Legibility -The sign should be very readable. The intended audience should not have to squint to read the sign. Also text and graphics should be chosen so that the reader can understand it easily. For instance, lots of small text on a sign designed to be read by those driving by, is not a good idea, as the drivers will not have time to read it. Colors -The right color for your signage is important for overall impact. Some colors have a higher visibility than others due to contrast, etc. Always try to have the greatest contrast in your sign, so that the intended audience will be able to read the sign easily. As you can see in the above graphic, some colors contrast better with others. For example, white and black or yellow and black are very good sign colors, so are red and blue on white. Type Style We have many different fonts that we can use for your sign. We usually stick to a select few however, as they tend to work best for most circumstances. We can also use your fonts of choice. You always want your sign to read clearly and quickly depending on the application and intended audience. Helvetica fonts (similar to Arial for windows users) or Sans Serif is one of our primary fonts. It is very readable at large sizes because it is very clear. At smaller sizes or in large amounts however it is not as readable. Times (Times New Roman for windows users) or Serif is another font used quite regularly. Times is not as readable in large sizes as Helvetica, but is very easy to read at smaller sizes or in large amounts.